The EstateMaster R+D team is constantly working on improving the product suite based on feedback from our users. This is part of the service that is provided to subscribers to our EstateMaster Annual Software Maintenance program to ensure they are always benefiting from the latest advancements to our software. Want to Upgrade to the Latest Version? A complete list of previous software updates can be found below. A new 'Home' screen, incorporating a Project Location Map and Dashboard for all Feasibilities and Developments. Setting the geolocation of Projects and displaying them on interactive maps. Export any data from the Enterprise Database to Excel and CSV files on an ad-hoc or scheduled basis. Update Exchange Rates for most currencies via a live online data source. Bulk import EstateMaster files found in sub-folders when conducting a 'Folder' Import. Upload and view photos and images for Projects. A Net Cash Flow Chart that is instantly displayed as soon as any Portfolio or Project is selected. Enhanced behavior of Portfolio pane on the main screen so that it doesn't refresh to the top of the Portfolio list when deleting a Portfolio or drag n dropping cash flows into a Portfolio. Sample Database feature to trial application functionality without needed to set up a database. Added HF files (*emhf) in the 'Import EM File' function. Bulk Import function to import multiple files stored in a file directory. New DM Profit & Margin Reports, reporting budgets and variances on a financial year and whole-of-life vs rest-of-life basis. New DM Summary Reports, reporting budgets and variances on a financial year and whole-of-life vs rest-of-life basis. Separate line items for Development Management Fees and Sales Commission on Summary-style reports. Separate line items for Capitalised Sales on all reports. A 'Select All' option for the DM Cost Code Cash Flow report. New IA Executive Summary Consolidated and Comparison report. Separated Development Management Fees and Sales Commission as separate lines on Cash Flow reports. Gross/Net Profit outputs on Forecast Summary report. 'Cost to Date' and 'Forecast to Complete' to DM Variation report. Start and End Date Range options for Variable Period Cash Flow report. A user-defined Current Month option for the Forecast Summary report. Additional IRR/NPV calculation option: Exclude financing and interest but include corporate tax. Updated formatting of Summary and Chart reports. Improved speed of importing of large files. Changed the financial year Gantt and Cash Flow reports to print in portrait mode. Implemented Microsoft Report Viewer 2012 for the Cash Flow reports, providing ability to export to XLSX format. Database Statistics screen to view information about the database currently connected to, such as file size, number of cash flows, etc. Capitalisation Summary Report for consolidating and comparing Estate Master IA cash flow models. Applied Report Sorting functionality to Comparison Reports. Ability to Edit the Project Number and Name. Added 'Used Fixed' option to Portfolio ribbon menu. Re-ordered Development Cost and Revenue sections in the report to make them consistent with Estate Master DF and DM reporting. Custom formulae entered in the Portfolio Financing Manual Adjustments screen saved. Additional options for Development Margin calculations make it consistent with Estate Master DF and DM. Added a new DM Cash Flow Variation report, which compares the budgets stored in DM files for the next 12 month period, along with costs to date and forecast to complete. A new Consolidated Summary report detailing each individual cash flow, as well as the consolidated results. Added 'Project Number' and 'Account Code' to the sort order for reports. More Information on Summary Reports: Additional information added to the Comparison and Consolidate Summary reports, such as Project Number, Account Code, Construction Commencement and Development Completion. Updated IA Dashboard: Changed the NPV and IRR for IA Cash Flows on the dashboard to include Long Term Vacancy Allowances. Improved Check for Updates Function: Changed the way the software detected updates to include all major and minor updates. Fixed Errors on running reports: Fixed the issue where a error message was displayed when trying to run the Sources & Application of Funds and DCF Monthly reports. Updated Advanced Filters: Changed the Date Range filters to be between and inclusive of the selected dates. Updated Loan 1 Manual Repayments in Portfolio Financing: Allow the user to have manual repayments for Loan 1, even if a Facility Limit was set to zero. Updated Portfolio Financing Rest Periods: Changed the rest periods that the 'Manual Adjustments' table used to be always Monthly, irrespective of the rest period of the individual Cash Flows. Reports Grouped in Projects: Added an option to group cashflow-style reports by Project Number and Name. Removed Merged Columns in Excel exports: Remove merged cells in the cash flow columns when reports were exported to Excel. New Report filtering: Filter the lists of Projects and Portfolios to show all of them, or just the ones created by the current user. Advanced Filters: Filter the list of all the cash flows in the database by different criteria, such as Type (Residential Comm, etc), Status (Approved, Completed, etc), Location, Developer, Land Owner, etc. Custom labeling of Miscellaneous Cost sections: The custom heading labels that the user defined in the DF/DM Miscellaneous Costs sections now come through on the CC reports, with the added benefit of overriding these labels as well when creating a Portfolio. New KPI’s on reports: Including a ‘Peak Equity Exposure’ on the Summary reports and the ‘Gross and New Profit’ and ‘Profit Share' on the DM Variation reports. Print Multiple Copies of Reports: Added ability to define number of copies when printing. Delete Multiple Cash Flows at a time: Rather than having to deleted one cash flow at a time, select multiple cash flows and delete them all in one click. Fix the current Cash Flows in a Portfolio: Right-click a Portfolio and fix the current Cash Flows to it so that the Portfolio is set with those. Improved Speed of Reports: Redesigned some reports to generate the results quicker, especially for larger Portfolios. Stock/Inventory Reports to track what is exchanged and settled on a quantity and area basis. Sources and Application of Funds Report to track where funds come from and where they are then utilised in a project. ‘Profit and Loss' and ‘Balance Sheet' reporting. Ability to filter the data by criteria such as location, developer, project type and status, etc. Support for the legislative changes to how GST is paid at settlement for the purchase of new residential premises or potential residential land (Australia only). Ability to export Tables created on custom worksheets to the Enterprise Database. Ability to enter Cell Comments in the Code, Stage and Description fields for most cost and revenue items. Ability to enter Comments for each Cost Code in the Chart of Accounts list, which then appear as cell comments when applied to cost and revenue items. Option to tile the Project Milestone window vertically or horizontally with the EstateMaster file. Popup picklist to link cost and revenue inputs to Project Milestone tasks. Preference to toggle Sales Commissions to be calculated on sales revenue inclusive of exclusive of tax. Expanded the Revenue Collection Profile table to now support up to 50 instalments (now located on the new 'Profiles' tab). Allow the Revenue Collection Profiles to continue collecting instalments post completion/settlement. Quickly navigate from an output on the Summary or Cash Flow report to its related input assumption via a single click. Option to populate a linked Word Document with the custom Property/Project Photo inserted on the Intro tab. Chart of Accounts utility to centrally manage a list of transactions accounts from a company's general ledger and assign them to project cost or revenue line items. Option to toggle Gridlines and Row/Column Headers on custom worksheets. Ability to use Milestone inputs for Loan Commencement/Maturity periods and Application Fee payment periods. Ability to use Milestone inputs for Revenue Collection Profile Installment inputs (when 'Specific Periods in Cash Flow' option is selected). Support for using Array Functions on Custom worksheets. Support for Data Tables (for scenario analysis), including importing Excel worksheets that contain Data Tables and creating them from scratch on the custom worksheets. A configurable timeout setting for the Validation tool to allow longer checks for circular references. Duplication/Clone function for Project Milestones. Gantt Chart Printing option for Project Milestones. Added xlsm file format to the Export to Excel function. Data Validation tool, to check for input data integrity, such as Circular References caused by user's custom formulas. Select specific stored Options/Stages to Export to Excel. Preference to charge Line Fees in arrears or in advance. Background calculations to check for multiple IRRs or where an IRR could not be calculated using the provided guess rate. New Funding Charts that graphically display the levels of debt and equity in the project. A 'Go To' feature to assist with navigating to specific input and reporting areas of the program via the F5 shortcut. Dedicated KPI dashboard with a collapsible panel and additional reporting metrics. Added Zoom scroller in application window for easier zooming in/out of spreadsheet interface. Additional input validation to improve data integrity. Update of spreadsheet interface (Spreadsheetgear), which includes support for 51 new Excel-compatible functions, Excel 2016 compatible conditional formatting and roved the performance of a number of worksheet functions. Project Milestones: Control the timings of your costs and revenues across all Development (DF and DM) CashFlows in a Project using an interactive Gantt Chart. Added formatting functionality (bold font and coloured cells) for Code/Stage/Description input fields for each line item. Allow linking to an Excel File that already has a link to an DF file with the same name. Added the input fields on the 'Intro' sheet to the Input Cell Protection function, so the user can password protect these inputs. Allow changing tab colours of custom worksheets. Added Residual Land Values and WACC to One-Way Sensitivity table. Added Three-Way Sensitivity tables for Residual Land Values. Advanced Word Linking, allowing the user export defined cells and charts on custom worksheets to linked Word Documents. Added Sample Files library on the Welcome screen. Added 'No of Units' column in Rental Income section to be able to enter multiple tenancies on one line. Added options to enter rental income on a 'per unit' basis and also on 'weekly' basis. More detail on the Land Owners Cash Flow for Joint Venture models. A 'Recalc All’ function for the stored Options/Stages to automatically recall and store each option to recalculate any formulas links to custom worksheets or external Excel files. A central application 'Welcome' screen that is loaded from a single shortcut within Windows. A Regional Settings function to define currency and tax settings that all new Estate Master file adopt. A 'Recent Files' listing in the 'Welcome' screen for each Estate Master application, showing all files recently saved and opened by the user. New application interface, along with more modernised report styling. Inserting a Property/Project image or photo on the Intro tab and Title page. Data tables to accompany the 2-Way What If Sensitivity charts. Remove DPI and file size limitations for inserting logos/images. Added Capitalised Sales as a separate item to be exported to the Enterprise Database. Sped up certain functions (File Open, Recall Option, Database Import, and Import from Previous). Disabled the automatic recalling and storing of Options/Stages when a previous versions file is opened in a new version of the application. Ability to define a single cell on a custom worksheet to store its value in the Enterprise Database. Added .dotm and .dotx file format to Word Links function. Ability to increase Revenue Collection Profiles to 20. Expand the the 'Month from Construction Start Release from Escrow' Inputs to one per ‘Revenue Collection Profile’. Changed Handover Summary calculations to ignore Revenue Collection Profile instalments. Upgraded application to utilise the Microsoft .Net 4.0 Framework. Exporting to an existing Excel file by appending worksheets. Password protection on custom worksheets. Percentage breakups for Rental Income and Sales Revenue category line items on Summary report. IRR/NPV calculation based on a cash flow excluding financing and interest but including corporate tax. Flexibility in creating Defined Names on custom worksheets, including the ability to set a value or text as the RefersTo property, not just a cell reference. Increased Disclaimer character limit to 2500. Separate Tenants sheet option in Print Reports menu. Reset function for the Preferences Password. Loan Type preference for Loans 1, 2, 3 and 4 to indicate whether a Loan is a 'Debt' or 'Equity' facility. Stipulate when to release sales revenue that is collected via the ‘Revenue Collection Profile’ instalments, based on the number of time periods after Construction Start. Increased maximum time periods to 480. Manual Override option for Corporate Tax liability payments so they can be adjusted on a periodic basis on the Financials sheet. Ability to set the payment frequency of Corporate Tax liability payments, such as monthly, quarterly, bi-annually and annually. Option to realise tax benefit at time of loss or roll forward loss until profit is realised. Revenue Accrual/Adjustment manual input line on the Revenue Recognition section of Financials worksheet. Asset Revaluation Adjustment manual input line on the Fixed Asset section of the Financials worksheet. Amortization Expense (Write-Back) manual input line on the Profit and Loss section of the Financials worksheet. Automatically default to the filename of the file when exporting to Excel. Provide option to export all Options/Stages in the file as separate files when exporting to Excel. Added the Preferences report to the main Print Report menu. Ability to still calculate Stamp Duty even when 'Nil Tax' is set in the Preferences. Ability to resize the windows when an external Excel file is opened while using the Excel Links feature. Allow user to select any Excel file when using 'Change Source' option in Excel Links feature. Multi-coloured Gantt Chart, which each cost and revenue section is represented by different coloured bars. 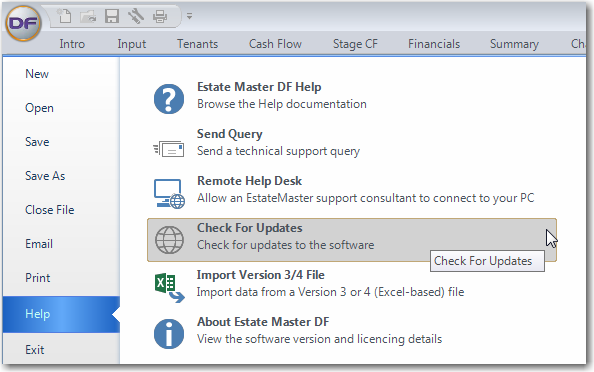 Ability to open an Estate Master DF Lite (*.emdfl) file. Upgraded SpreadsheetGear spreadsheet interface, including support for SUMIFS, AVERAGEIFS and COUNTIFS functions. 'Insert Image' function on custom worksheets. 'Data' functionality, such as Sorting, Grouping and Auto-Filters on the custom worksheets. Displaying the last Option/Stage recalled or stored in the application Status bar. Ability to copy any of the charts (on either the standard reports or custom worksheets) to the clipboard so it can be pasted in external documents as an image. Listing the status of Integration Modules (whether they are enabled or disabled for the specific licence) in the About screen. Updated the 'Export to Excel' function so that additional components (i.e. Charts, Range Names) are exported with the file. Integration with Microsoft Word, to allow Bookmarks in a Word Document to be populated by predefined outputs. Integration with Microsoft Excel, to allow 2-way live linking with external Excel Workbooks. Allowing copying/pasting of formulas on standard worksheets. Ability to change the order of custom sheet tabs as they appear in the workbook. Relabelling Construction heading on Summary sheet to remove "(inc Contingency)" if no contingency is used in the model. Added warning when renaming or deleting custom sheets that it may impact Options/Stages. Print custom worksheets from the main Print Menu. Improved logic for Sales Commission calculations so that the calculated amounts each period aligned with the Sales Revenue payments, rather than being evenly spread. Allowing larger cost codes to be entered and displayed in the model. The ability to password lock input cells for over 40 different input areas for increased data integrity. New Formatting menu for custom sheets, including a Format Painter. Increased number of instalments from 9 to 12 for the Sales Revenue Collection Profile. Ability to vary the corporate tax rate for each cash flow period. Added the Freeze Pane functionality to custom sheets. No dependence on Microsoft Excel required. Microsoft Excel compatible functions such as entering formulas in input fields, linking cells, inserting additional worksheets, etc. Faster opening, saving and closing of files. A more robust and scalable software platform, providing a better development foundation for future enhancements. This process has already been successful in our new Investment Appraisal (IA) program. For an example of how this new platform will look, please download and evaluate a trial of Estate Master IA. Allow linking to an Excel File that already has a link to an DFL file with the same name. Add Three-Way Sensitivity tables for Residual Land Values. Add option to enter rental income on a per unit basis and also on weekly basis. Ability to enter in a Settlement month before the lease end date for Capitalised Sales. New PDF function that doesn't require installation of postscript printer drivers. A 'Recalc All' function for the stored Options/Stages to automatically recall and store each option to recalculate any formulas links to custom worksheets or external Excel files. A Regional Settings function to define currency and tax settings that all new EstateMaster file adopt. A 'Recent Files' listing in the 'Welcome' screen for each EstateMaster application, showing all files recently saved and opened by the user. Sped up certain functions (File Open, Recall Option). Automatically default to he filename of the file when exporting to Excel. Paper Size option added to the Page Setup settings of custom worksheets. Ability to resize the windows when an external Excel file is opened within EstateMaster DF Lite while using the Excel Links feature. Listing the status of Integration Modules (whether they are enabled or disabled for the specific licence) in the About EstateMaster DF Lite screen. Intuit QuickBooks Online as an Accounting System import source; an interface to allow you to import actuals from the QuickBooks Online accounting system. A Contingency Balancing Account feature where Construction and Project Contingencies can be automatically drawn upon to fund increases in costs based on a fixed budget amount. Construction lien holdback functionality to hold a particular percentage of a Professional Fee or Construction Cost payment for a stipulated length of time. Quickly navigate from an output on the Summary report to its related input assumption via a single click. Microsoft SQL Server as an Accounting System import source; an interface to allow you to import actuals from SQL-based accounting systems. Salesforce.com as a Sales CRM import source; an interface to allow you to import sales contract data from customised Salesforce-based CRM systems. Propertybase as a Sales CRM import source; an interface to allow you to import sales contract data from a Real Estate CRM system. A Cost Code 'Inclusions' function for the Xero Accounting Integration that allows you to define non Expense or Revenue Cost Codes (i.e.Equity, Assets or Liabilities) that you want included in the import process. New Funding Charts that graphically display the levels of debt and equity in the project, changes between budgets, and a forecast of the future funding requirements. Allow linking to an Excel File that already has a link to an DM file with the same name. Allow locking of the Current Month column in the Cash Flow, in addition to the historical months. Added WACC to One-Way Sensitivity table. Locking the 'Date of First Period' input and 'Cash Flow Rest Period' preference, once the model has rolled forward past period 0. Extended Cost and Revenue Escalation Tables to 20 Years. Stage Cash Flow report, allowing the user to assign individual cost and revenue line items to a specific Stage in the project, then have the Stage Cash Flow report, provide a stage-by-stage breakdown. Improvements in the 'Change Source' and 'Break Links' options in the Excel Links functions. Added integration with MYOB Live. Additional outputs added for the Word Link feature (bookmarks for the stored Forecasts/Budgets and Cost to Date data). Ability to increase Sales/Rental Land Use categories to 20. Added CSV file types to importing accounts data from External File option. Manual Budget column on Cash Flow worksheet to manually input a budget per line items. Auto-Save feature after setting Budgets. Locking function for individual Cash Flow line items. Stage filter on the Cash Flow report. Printing Input Assumptions in Landscape mode for all paper sizes if applicable. Reduced time taken to Roll Forward. Ability to unlock the Equity, Surplus Cash and Loan Drawdown and Repayment lines in the cash flow for manual override of the default formulae. Expanded the 'Cash Flow View Options' function so that more columns in the Cash Flow sheet can be hidden. Updated the 'Standard Table' format for the 'Update from Accounts' procedure to allow dates to be populated by formulas. Updated the 'Standard Table' format for the 'Update from Accounts' procedure to exclude the header row in the selected data. Importing of custom worksheets from a DF file when importing a feasibility. Updated MYOB integration to import 'Money Spent' and 'Money Received' transactions. Updated MYOB integration to allow user to select to import data on either cash or accrual basis. Additional Chart to display the Net Cash Flow for all budgets/forecasts. New data import format for the 'Update from Accounts' function. Allow linking to an Excel File that already has a link to an HF file with the same name. Template functionality to allow user to create application templates that contain pre-defined inputs and settings. A 'Recalc All’ function for the stored Options/Stages to automatically recall and store each option to recalculate any formulas links to custom worksheets or external Excel files (DF only). User-definable 'Days per Year' operational input. Office Links feature: integration with external Excel Workbooks and Word Documents. F+B Revenue input for up to 20 Restaurants. Upgraded print menu functions, including the ability to nominate number of copies, report sort order, printing multiple stored options/stages and printing custom worksheets. Ability to set and password lock preferences. Allow linking to an Excel File that already has a link to an IA file with the same name. Added Property Description input field on Intro tab. Allowed Rent Review Start to be manually set for each Tenant. Added Escalation profiles to Capex items. Added Preference to calculate Market Rent escalation at lease anniversary or financial year start. Added Preference to recover outgoings when the cost is paid, or spread over the financial year. Added an 'Upwards Only' rent review option for each Tenant. Added Fixed Percentage annual rent review options for each Tenant. Tenancy Import function to import tenancy schedules from Excel or CSV files exported from other systems. Tenant and setting up the frequency of rent reviews. A Quick Input Wizard for entering tenant and lease inputs via a form interface. Assumed Purchase Price excluding Costs in the'DCF Approach' section on the Exec Summary report. Added the Preferences report to the Preference dialog and to the main Print Report menu. Insert Image' function on custom worksheets. Ability to copy/paste of formulas on the standard input worksheets. Ability to change the order of custom sheet tabs as they appear in the workbook. Print custom worksheets from the main Print Menu. Ability to manually nominate a Terminal Sale Value. Added Vacancy and Lease Up period to Bonus/Shortfall calculations. Adjusted Terminal Sale Value by incentives and Lease Up vacancies. Changed the way rental income was handled at Lease Expiry/Termination to make it more in-line with industry standards in relation to lease terms. Restore the view options for the Tenants, Outgoings, DCF and Investment sheets when the file is opened to their previous state (e.g. user-defined hidden rows, columns, etc). In-built 'Email File' function to send files directly within program to any email address. A warning on the Tenant 'Reset Row' function. Updated styling on many of the dialogs/forms, such as Preferences, Printing, etc. Updated Printing functionality to include in-built PDF printing and multiple copy printing. Updated Outgoings chart to hide any cost rows or benchmarks that are not used. Added the Freeze Pane and Sheet Protection functionality to custom sheets. Additional input validation on File Save to ensure the correct Use and Escalation Profile codes have been entered throughout the model. Added Help buttons to most dialogs/forms, for a quick link to the relevant topic in the Help file. Ability to import a custom worksheet from an external Excel file. Up to 40-year property cash flow and investment reporting. Average Lease Term options for long term tenant renewal forecasting.